The camera to carry everywhere. A little more automatic than the XA, less expensive and more plentyfull. Don't leave home without one. 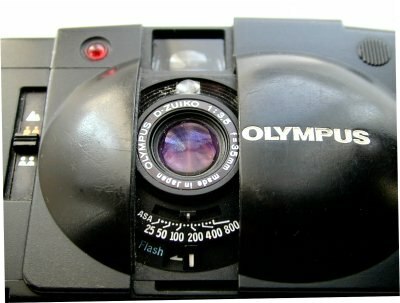 The Olympus XA2 was honored with the top award out of 2,791 entries in the 1981 Good Design Mark Competition sponsored by the Japan Industrial Design Promotion Association. It was selected as the single item most representative of the ultimate level of precision technology in Japan. Touch it and you'll know why. It has a high-grade F-Zuiko 35mm F3.5 lens, much easier to build than the complex 2.8 lens of the XA, and the extra half stop is neither here nor there . Focussing is via a 3 zone system. A lever on the front of the camera is set to one of 3 symbols. When you close the camera, it resets to the "normal" setting. Provided you keep 1.2 metres or so from your subject and it is daylight, just point and click. In poor light use the mountain setting for views or they will not be sharp. This is the only thing you need beware of - your XA2 will do the rest for you. But if you need the manual, it is here. 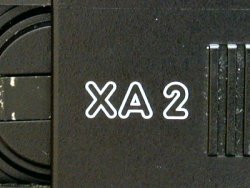 There is a small lever on the base of the camera. 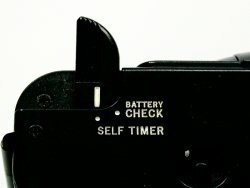 This gives a battery check and a self-timer. The delay time of the self-timer is about 12 seconds after release of the shutter button. The red LED on the front panel blinks and an electronic sound beeps on and off. Also available in various colours - urban white, heart red and blue, all with matching A11 flash - all very rare. A special pink commerative model was also made - extremely rare.